As kids we must have heard it everyday from our elders to eat slowly and chew our food well before swallowing. We probably tell the same to our children at breakfast and dinner tables. Is there any logic to this advice? Our parents must have surely known the benefits of eating slowly, with undivided attention. Because, eating food is not just to satisfy hunger and the cravings of the palate and the tongue. Eating is a ritual that has to be slow, peaceful and mindful engaging the body and mind. Is it important to chew food well before swallowing ? Yes. Chewing food well before swallowing is important because the process of digestion begins in the mouth. When you chew on your food, you break down the food into finer particles. This makes it easier for the body to absorb all the nutrients. The food when mixed with saliva is easier to swallow. Digestion is a complex process. And the first step begins in the mouth with the digestive enzymes in the saliva. When the food is not chewed well, the larger particles remain longer in the gut. This invites bad bacteria and fungi to produce neurotoxins in the gut. Most people probably think that if you eat quickly and a lot of food is not digested its a good thing for weight loss. This is not true. Chewing your food many times at a slower pace can reduce your overall food intake. There needs to be enough time for your brain to recognise that you have eaten. If you eat too quickly you might end up eating more than the required amount. And that’s why slowing down while eating may be a good weight management strategy. The food needs to be in contact with the gut for longer to stimulate hormones that regulate hunger. The reduces intermittent snacking. The acids in the stomach cannot digest all the components in the food. The salivary enzymes do the first steps of digestion and reduces the digestive load on the stomach. Undigested food in the stomach can cause these problems. Experts say the the particle size in the swallowed food affects the bioaccessibility of the energy of the food. The more you chew, the less is lost and more is retained by the body. Don’t overload your spoon or the fork. Place your fork and spoon down in the plate after every bite. Close your lips and start chewing. Your tongue should move the food from side to side and your jaw should rotate slightly. You can swallow when the bite has lost its texture. In today’s hectic schedules with poor sleep, travel, lifestyle and overall stress, everyone is prone to some gut imbalance that can cause mild to moderate discomfort. Daily probiotic intake is important as they infuse your body with millions of beneficial bacteria. With time, these restore a balance and helping healing digestive conditions. Digestive enzymes are beneficial if you have a leaky gut, eat a lot of processed food, or are above 30 years of age. These enzymes facilitate many mechanisms in the body including the absorption of nutrients. A short stroll after a meal can aid digestion and normalise blood sugar levels. These 20-minute walks 10-15 minutes after dinner may be more beneficial than a 45-minute early morning walk. Vegetables are loaded with vitamins, minerals and compliment any protein-rich or carb-rich diet. Eat raw or slightly steamed vegetables, which may contain higher amounts of enzymes and fibres. This helps in the gastric motility and most nutrients to be absorbed. 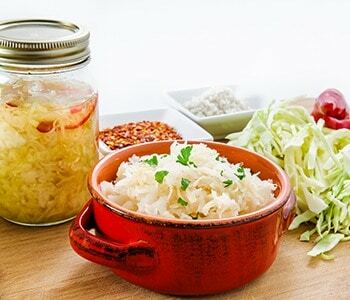 Foods like sauerkraut and pickles already contain many digestive enzymes and beneficial bacteria that help in digestion. They also help the body absorb nutrients.Eating these foods can reduce symptoms of irritable bowel syndrome, gluten intolerance and allergies by boosting the immune system. Drinking lots of liquids during or right after a meal can adversely affect digestion by diluting the vital digestive juices and stomach acids. You can drink water 30 minutes before a meal. This increases the efficiency of your digestion. Caffeine is a diuretic. A small quantity can speed up the digestion, which is helpful in cases of slower bowel movements. But at higher doses, it may speed up digestion so much that your body may not have the time ti extract all the nutrients. Caffeine is also highly acidic. It may also cause heartburn. Sugars are digested quickly. High quantities of sweets may ferment over the other foods and cause bloating, gas and pain. Processed desserts and high- sugar beverages will make it harder to normalise your blood sugar levels. This defeats the very goal of eating a meal, which is to normalise your blood sugar levels. A little fruit or a small square of dark chocolate may be beneficial. When you have eaten a meal, your body directs the blood flow to the stomach and the other organs of digestion. Strenous exercise may bring this process to a halt. The energy required for digestion becomes less efficient. This affects both the digestive and circulatory systems adversely. A hot shower or bath increases your body temperature. When this happens the blood that is required to aid digestion gets diverted to the extremities to regulate the body temperature. This will slow down digestion. Your body sugar levels spikes after a meal. Your body needs a few hours to normalise the sugar levels. Sleeping may increase insulin dependence. Sleeping after meals as a habit can make you insulin resistant, a precursor to diabetes. So what’s with the number 32? It may not be the magical number. But it emphasises the importance of eating slowly and chewing your food well, because we have scientific evidence to prove it.